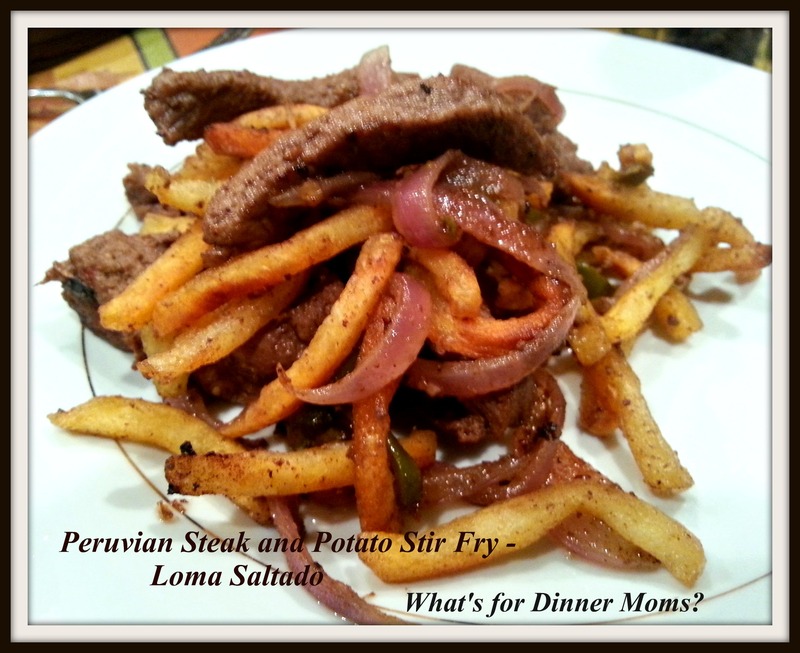 Peruvian Steak and Potato Stir-Fry – Loma Saltado – What's for Dinner Moms? One last dinner from our archives. Tomorrow I will be back with daily dinner posts. Catching up from vacation is tough! Have a great day friends and enjoy Fat Tuesday! For us to eat steak for dinner is a rare occurrence. I try to keep dinners rather inexpensive. My kids say cheap but I prefer frugal. I don’t buy anything unless it is at its lowest price on sale. I have a tally of what the rock bottom sale prices are in our area so I know when to buy certain items. This steak was $3.29 a pound which for our area is a decent price so I splurged. Yes, my kids even cheered when I brought the steak home. I knew I needed to figure out a way to cook it. I found this recipe on Pinterest for Peruvian Steak and Potato Stir-Fry from Food and Wine.com. Normally a recipe from Food and Wine magazine might scare me away because some of them are very fussy but this one seemed very accessible to even a Mommy Cook like me. This dish is hot! I mean spicy, spicy, hot! We all really liked it though. We did not add extra hot sauce on at the table like was suggested in the recipe. Instead my children were adding a sour cream topping to tone down the spiciness. Both of my children like spice but this was a bit too much. It was a delicious dish though and the sour cream really worked with the flavors. So, this is a dish I will be making again. I served this with a green side salad and steamed broccoli as a side dish. For my mostly gluten-free son the best part was this is gluten-free! Just make sure all of your spices are gluten-free. In a large bowl, combine the olive oil, cumin, coriander, garlic and a generous pinch each of salt and pepper. Cut the steak into 1-inch thick slices and add to the bowl along with the onion. Let marinate for at least 10 minutes. Meanwhile, in a large skillet, heat 1/2 inch of oil until shimmering. Add the french fries and fry over high heat until golden and crisp, about 3 minutes; drain fries on paper towels. Remove oil from skillet and wipe out with a paper towel. Add the steak and onion along with the pickled jalapeños and stir-fry over high heat until the meat and onion are cooked through and lightly charred, 3 to 4 minutes. Add the tomato and cook until softened and beginning to char, about 1 minute. Add the french fries and flip with a spatula to combine. Serve right away with hot sauce if desired. Next Post Easy Oven Cheeseburgers – Great for a Crowd ! I wish I was having this for dinner! I like this. I’m marking it to make when next I have french fries or potatoes in the house. It was so good and soooo spicy! Steak and fries and jalapeños? Sounds delish! Oh!! YUM!! Very nice, Marci!! Broccoli on a side, plus, jalapenos. Sounds great!